ISenior Professor at the Economics Institute, Federal University of Uberlândia, Minas Gerais; Department of Economy and Environment manager, Ministry of the Environment. Translation from Estudos Sociedade e Agricultura, Rio de Janeiro, vol. 18 no. 2, p. 288-316, Outubro 2010. This essay discusses the complex relationship between the agrarian question and biodiversity conservation, showing that the principal disagreements have emerged from the dominant productivity-orientedÂ Â model of the "green revolution". It argues that the productive efficiency did not avoid the environmental and social "tragedy of the non-commons", giving political space to agrarian reform proposals, consolidating family and peasant agriculture and paving the road for agroecological reconversion. This reconversion, however, is hampered by the high transition cost and the lack of scientific support. A new and potentially favourable policy framework that could make this transition viableÂ is that of payment for environmental services. Keywords: agrarian question; environmental policy; agroecology. In the environmental-agrarian debate established in the Brazilian literature, peasant form of production was always been hailed as sustainable because it is based on wise ecosystem management. This vision has historical support, as shown by Mazoyer and Roudart (1998) in "Histoire des Agricultures Du Monde". In agricultural history, this activity was developed to feed people, with agrarian systems based on natural fertilization of the soil. This means that they sought to develop natural ways of fertility regeneration, even after the deforestation that decimated the forest of European feudal empires. Many agrarian systems were developed from pastoralism to policulture, from slash and burn and shifting cultivation to continuous chemical cultivation, from hydraulic to tropical savanna policulture and husbandry systems, and allowed rural societies to solve their problem of food supply for centuries. The recent world agrarian crisis is more a crisis of the agrarian system based on II Agricultural Revolution technology of modern times, started from fantastic advances in agricultural chemistry and Mendelian genetics. The crisis, however, happens differently in developed and developing countries: in the first, an overproduction crisis and at the same time of productive inefficiency, as requires daily U$ 1 billion subsidies; in the latter, a crisis of poverty, famine and social differentiation, created by controversial agricultural modernization policies. In Brazil, the recent agrarian debate passed through the criticism of conservative agricultural model and the struggle for a redistributive agrarian reform. Peasant family farming comes into this debate as a victim of this centralizing and excluding model, creating thousands of landless families, feeding the rank of social movements in the struggle for agrarian reform on one hand, and on the other, feeding the labor demand required by the industrialization and urbanization since the 1960s. From environmental viewpoint, main criticisms to agricultural technology model are the ecosystem simplification, the diffusion of monocultures (cotton, soybean, maize, sugarcane, coffee) causing genetic erosion and chemical technology (pesticides and chemical fertilizers) causing water and soil pollution. The family farming, as abandoned traditional cultivation practices and adopted the same "green revolution" technology model, based on improved seeds, agrochemicals and tractor mechanization, encouraged by PRONAF, is also subject to the same criticisms and the same dilemmas and vulnerability. The joint renegotiation (family and capitalist farmers) of farm debt occurred in 2008 reasserts the same vulnerability of the production model. Besides the production model, other environmental criticism that gains international contour and prominence is that the farming use of land is the main cause of deforestation, especially cattle ranching in frontier areas. Also in this criticism, family farming is not excluded because its forms of occupation (land squatting and settlement) reproduce the same pattern of land use: extraction of timber, deforestation (slash and burn), temporary cultivation and cattle ranching. In the Amazon region, differently from the shifting cultivation experience of the South, the fallow land for fertility restoration cases are few, due to the demand pressure, these cultivated areas become pasturelands. In this way, settlers and land squatters (posseiros) are also included as responsible for the deforestation of the Amazon, the major source of greenhouse gas emissions in Brazilian inventory. In this context, rural social movements associated to environmental movements, brought about a new debate that it worth exploring, the payment for environmental services. The thesis is the following: degraded areas by farming activities must be recovered with an alternative agroecological model. The transition to this alternative production generates environmental services with benefits to all society, deserving being remunerated. This text argues that the payment for environmental services, now being converted to national policy, may be an excellent public policy tool for the consolidation of a new agroecological production for family farmers and include productively more than three million peasants with no access to resources and many of them dependents on public grants (Bolsa Família) for survival. The relationship between farm economy and nature degradation is explained, in dominant way, by "moral sentiments" that lead to the liberal creed of "invisible hand" of the market (SMITH, 1999) and by the metaphor never demonstrated of the "tragedy of the commons" (HARDIN, 1968). The "invisible hand" of the market works as a coordinating entity, of common interests and dismiss policies or State intervention. The freedom of individuals in the defense of their own interests in the productive use of "commons" may end up in environmental tragedy (degradation of grazing land) and social (everybody loses). This is why the institution of private property would be the best way to manage environment and the protection of the society against poverty. These liberal dogmas needed not be evoked if they were not causing so much real "tragedies" of "non-commons", the most recent of them the unprecedented global economic crisis, worse than that of 1929. The worse of all this is that, in spite of the lack of historical evidence of liberal foundations, these dogmas or ideologies are the base of world governance strategies, such as conveyed by the World Bank, the International Monetary Fund and other important United Nations organisms. With the emergence of giant transnational corporation and financial globalization headed the financial monopoly capital, the "death" of State-nation was announced, mainly in its regulatory function of the economy. The State would have a minimal structure for the national security, create an institutional and regulatory environment for the private business and ensure certain social rights and functions such as basic education, public security among others. In Brazil, the developmentist state initiated in the Vargas era (1940), extended in the Kubitschek (1950) and completed in the military (1960), started being eroded and undermined by neoliberal ideology of the Washington Consensus in the Collor and FHC eras, following the stigma created in the Reagan-Thatcher governments in the 1980s. Still conforming the neoliberal thinking, one can also point to the deviation of the focus of settlements to the public lands available in the Amazon region. The Amazon is the agricultural frontier area where predominantly colonization settlements, not expropriation of unproductive private properties, prevailed. The Figure 1 shows how the number of settlements increased in frontier areas and in the Northeast and stagnated in the large cattle latifundia dominated cerrado of the Center Western/Southeast areas, where large farms (fazendas) with degraded pastureland are mostly located. Only in the Triângulo Mineiro area, in the 1990s, the number of settlements in unproductive cattle "fazendas" with degraded pasturelands to the point to reach the GUT index needed for expropriation, has increased. In 2006, 40.2% of settled families were in the Northern region and 33,7% in the Northeast, that is, Â¾ of total. In the Center-West, where the large depositary of the so-called "internal frontier" or degraded pastureland is located, the INCRA obtained a modest result in the number of settled families. Is interesting to see that, as well in the FHC as in the Lula governments, the increase in number of settlements in the North and the Northeast were the same, the rate were slightly faster in Lula's government. Actually, annual rate of growth went down from 1998 on, with upward inflexion only in 2004, in Lula's government. These data have shown that, despite in relatively minor proportion than in land squatting processes, government settlements contributed to the increase in the deforestation rate in the frontier area. This is because the methods of land use are the same, as discussed earlier. Recently, in the plea for a sugarcane ethanol bioenergy policy aiming at the international market, Brazilian government used the argument of "idle" degraded pastureland of 100 million hectares, that is, this vast "internal frontier" would be available. The argument is used to avoid criticisms that the expansion of the sugar cane production for ethanol does not mean the deforestation of the Amazon region, but it can be used to say that there are large "fazendas" with low production or unproductive because of the soil degradation, for the agrarian reform. This is the typical case of the "tragedy of the non-commons", contradicting Hardin and his followers. The environmentalist vision of biodiversity conservation treats agriculture and other productive activities as a "threat" to the maintenance of ecosystem functions of main biomes of the country, of which three of them are considered natural patrimony of the humanity - the Amazonian, the Pantanal and the Atlantic forest. Other two biomes - the cerrado and the caatinga - are in the deputy Pedro Wilson's Law Project, asking for the same protective legal treatment of natural patrimony of the humanity. The environmental policy is armed with powerful legal instruments such as the law nÂº 4771, of September 15th, 1965, instituting the New Forest Code and the law nÂº 9985, of July 18th, 2000, instituting the National System of Conservation Units (SNUC) and the more recent regulation of the law establishing penalties for environmental crimes (Nature Law nÂº 9568/1998). The Forest Code establishes clear rules for land use in private properties, limiting the use rights in part of the property considered of common interest such as water spring and water body protection areas (Área de Preservação Permanente - APP) and biodiversity protection (Área de Reserva Legal - Â ARL). In the APP no productive activity is allowed, but in the ARL the law allows the "sustainable use" through a management plan. In this area is allowed the extraction of timber for sale or self-consumption, of seeds, fruits, resins, oils or other wood products named as non-timber forestry products. The SNUC Law establishes many forms of protected areas in federal, state and municipal levels. Include protected areas classified in three major groups, namely: (a) Integral Protection Units; (b) Sustainable Use Units; and (c) Indigenous Reserve. For the agrarian policy, the Law nÂº 11326, of July 24th, 2006, establishes guidance for the formulation of the national policy of family farming and rural family enterprises, and gains strategic importance for the biodiversity conservation because it assumes as rural family producer the sustainable use conservation unit dwellers. The law further consider the rural families eligible for policy instruments, the quilombolas, the artisanal fishermen, the extractivist producers, among others. These forms of economic exploration of protected areas, in public and private lands, translate the meaning of sustainable development in the environmental legislation, and have been supported by environmentalists for the biodiversity conservation. In essence, remains the primacy of preservationism over the precept of social function of the land use, established in the Land Statute (Estatuto da Terra), law nÂ° 4504, of November 30th, 1964. This law, although instituted by the military government in order to refrain agrarian reform demanded by social movements in their struggle for land in the Goulart period, contains an article (2) that asks the Public Power to "b) manage appropriately for land property to perform its social function, stimulating plans for its rational use, promoting fair remuneration and the access to workers the benefits of the increase in productivity and to the collective well-being." This agrarian-environmental legal base has been translated by successive governments into a biodiversity conservation policy; its main focus is the protection of forests by creating conservation units. On strongly preservationist line, there is an understanding that this is the most effective way for biodiversity conservation. Brazil has now more than 80 million hectares in conservation units in all modalities predicted in the SNUC, representing 12% of total surface of the country. Other possible strategies for biodiversity conservation, the sustainable use of the biodiversity and the sustainable production, became the preferred theme for international cooperation and non-governmental organization actions. The program that treats biodiversity conservation included in the Multi-annual Plan (PPA) of the Ministry of the Environment (MMA) has only a timid technical support for local small organizations dedicated to extrativist activities. These activities are listed in the agrosociobiodiversity action plan. Programs such as the Pilot Program for Tropical Forest Protection in Brazil (PPG7), resulted from the international cooperation, dominated the MMA actions until recently. Since 1995, this program invested more than U$ 40 million in sub-programs such as the Protected Areas (ARPA), the Demonstrative (PDA), the Alternatives to Deforestation and Burning (PADEQ), the Natural Resources Policy (SPRN), completing its first phase in 2006. The second phase was supposed to become a new program, with new institutional arrangement, but instead its Amazonian version was incorporated in the so-called Sustainable Amazon Program (PAS), now coordinated by the Special Secretary of Strategic Affairs (SAE), of the Presidency. In this program is included a clear sustainable production action, understood as economic activity of the sustainable use of forest. All program investments are directed to give tools for state governments to encourage sustainable production, while federal investments are mostly turned to logistics and institutional structure such as land regularization. This latter problem is considered the main obstacle for a sustainable development project in the Amazon region. Some state governments are worried about how to make extractive activities economically viable in protected areas, but little success is noticed. Price incentives to Brazil nuts and natural rubber are not sufficient for the extrativist reserve dwellers in Acre, for instance, to assure their own livelihood. In order to meet their own subsistence needs, extractivist dwellers reserve management plan. The last PDA 2007 report pointed out that demonstrative environmental projects reached more than 100 thousand beneficiary families in both Amazonian and Mata Atlântica biomes. In PDA, organic production, extractive products processing plants, handcrafts activities and even export contracting projects were financial, organizational and technically supported. The economic, environmental and social impact assessment of this program is still to be done. In sum, environmental policy treats only extractive production and adequate forest management as biodiversity conservation activities, with no concern with the agricultural (including forestry and husbandry) production area. It is well known that extractive activity has difficulties in valuing forest goods and services and transforming it into income sufficient for the household subsistence, reason why more than four million peasants became farmers. Even Indians from small reserves don't make their living without cultivation activities, as most of them have their cultivated foods such as manioc, corn and potato, as culture. Also, extractivist families inside conservation units do not survive selling nuts, rubber, oil seeds for many purposes (medicaments, cosmetics, foods) and expand cultivation activities, especially husbandry. The solution for this problem requires a more integrated agrarian-environmental policy. The debate on ecologically healthy food production outside protected areas has its origin in the ecological criticism to agrochemical industrial technology, since Rachel Carson's seminal work "Silent Spring", in the 1960s, in the USA. In Brazil, this same criticism had strong repercussion in areas of advanced agricultural modernization in the South and Southeast, resulting from the success of the agricultural policy set in place in the 1960s. This policy stimulated the appropriation by industries of parts of agricultural production process, mainly the agrochemical and mechanical industry, to which genetic research adapted crop seeds responsive to the characteristics of the industrial products. From this effort, seeds responsive to increasing dose of chemical fertilizers, reduction of genetic variability of crop species - monoculture suitable for extensive mechanization, altering the ecosystem and producing ecological disequilibrium and biodiversity loss. This is the reason why the incidence of pests and diseases rise, biologically speaking, are the result of disequilibria provoked by agrochemical-mechanical technology. The industrial response for these disequilibria were the production and use of pesticides, introducing other environmental damages and workers and general population health problems, reported by Rachel Carson in her Silent Spring (1962) and by many other writers. In the 1980s, from this ecological criticism in Brazil, agronomists, land social movements and student's movement were politically mobilized in favor of an alternative agriculture, by organizing the Brazilian Meeting for Alternative Agriculture (EBAA), with three historical edition taking place. The Petrópolis meeting gathered 17 state agriculture secretaries led by Claus Germer, from Paraná, at the time echoing stuning criticisms from Sebastião Pinheiro, Ana Maria Primavesi, José Lutzenberger, Luiz Carlos Pinheiro Machado, among others. International scientists such as Miguel Altieri were heard in Brazil, introducing the debate on agroecology concept. The scientific base of this approach intended to question the inexorability of the productivist model dictated by the dominant policy, consuming the totality of financial resources available for agricultural research. Non-governmental organizations acting in the rural area with participatory approach such as the rapid rural appraisal and action-research methods, with its core idea of empowerment of rural populations, soon understood the need for a scientific base for their actions, offering technological alternatives with more autonomy and knowledge appropriation, to deal with the production problem. Initiatives led by Advisory and Services to Alternative Agriculture Projects (AS-PTA), with experiments with high yielding corn variety corn and agroecological management, showed that there were alternatives to upstream industrial technology dependent productivist model. These experiments carried out with the support of Embrapa Agrobiology has been discontinued and did not become a policy, in spite of efforts in this sense made by AS-PTA leaders. A great deal of hope was deposited on Lula's election, having the presidency of Embrapa and in the Ministry of Agrarian Development (MDA) as eminent supporters of a more ecological agriculture. Rural social movements were playing an important role in the political mobilization of family farming sector, gathering CONTAG and the Landless Movement (MST) in Agroecology National Meeting (ENA), with its third edition held in 2007. The response in terms of national policy is that the MDA has conditioned the use of federal resources by state policies for technical assistance and extension services, to the adhesion to agroecological model. Notables and intellectual mentors of agroecology program of Workers Party in Rio Grande do Sul state are in the command position at the MDA, proposing its nationalization. The problem of agroecological conversion incentive policy is not only the resistance of industrial interest of the productivist model and the critical vision that it was a downturn to the technological backwardness of the past and low productivity, but also the real difficulties of lack of scientific knowledge, the ecologically appropriate technique and the high transition costs. Many technicians and farmers lost the ability to recognize and interpret ecological functions of the land and the biodiversity in the food production, the energy management and the water flow in the ecosystem, among others. The Pronaf Agroecology, Pronaf Florestry and other credit programs created to assist farmers willing to convert their production system to a more sustainable alternative, are difficult to access, and the program does not leave the ground. That is why there is an effort to devise a financing program by production systems. The agroecological transition cost is high because the productive land already lost its main biological characteristics and is in highly degraded state, either by excess of agrochemical use or by the traditional farming practice of continuous cultivation without fertility restitution. In traditional shifting farming system with long fallow, at least there is natural restitution, but it only works in situation of abundant fertile land and in communal ownership system. 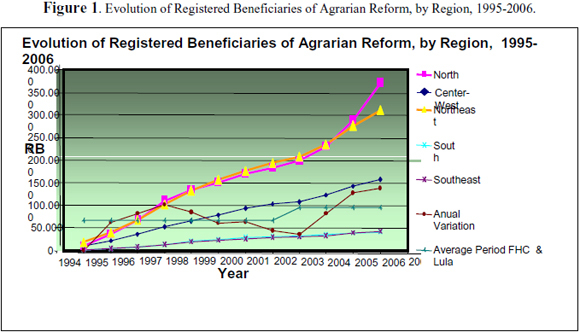 Brazilian agrarian question until the 1990s was dominated by the debate on the nature of capitalist agriculture and the peasant differentiation, reproducing the discussion of rural development roads occurred in Europe and the United States. The unproductive latifundium was seen as the major backwardness factor of the agriculture and the agrarian reform, the solution. The reading of European development experiences had many versions, nuanced by authors next to Kautsky up to Chayanov, about the nature of the Brazilian peasantry. The core of the discussion was in knowing how to interpret the family laborer, indicating on the one hand, non-capitalist relation, different from the salaried laborer, who sells his workforce and, therefore, establish a typical capitalist relation of production. For authors as Nazareth Wanderley (2000), this family labor relation dictated other accumulation logic, stressing on the family reproduction, not that of capital, conferring certain autonomy, vis-à-vis the capitalist mode of production, coming close to the Chayanovian proposal of peasant economy. However, these readings did not influenced agrarian policies and even the rural worker organizations, such as the CONTAG, which remained stuck to the fight for land as main flag and for better labor conditions for the "bóias-frias" workers in capitalist agricultural regions. In policy-making centers, rural oligarchy, fascinated by the conservative modernization policy (without modifying the concentrated agrarian structure), politically indulge public lands to landless workers under the frame of large colonization projects. These projects were the yardstick of the dictatorship's agrarian policy, and worked as a wedge for the opening of the agricultural frontier of the Center-west and the North of the country. Sizeable public investments in infra-structure were essential for the expansion of a vast land market, keeping the land prices low. By the way, this was one of the crucial competitiveness factor of the modernized farming sector, together with subsidized credit, investment in research and extension, minimum prices guarantee and other policy instruments consolidated by the military regime. In the 1990s, the neoliberal avalanche inaugurated in Brazil by Collor, buried in practice the structuralist development discussion and gave place to discussion about the small scale production efficiency, its ability to absorb technology and if land settlements were not a reproduction of rural shantytowns (favelas), with no use for the country's agricultural economy. In a strategic change for the country's development, Brazilian agricultural potential capacity was evoked in order to become competitive and drive the economy towards the agricultural commodity export sector. The liberalizing wave, the de-statization, the structural adjustment that led to market deregulation, starting by creating MERCOSUR, opened up Brazil to the international market and kept Brazil as one having the lowest growth rate in the world. In this strategy, rural laborers reserve army that migrates at millions to industrial-urban sector, allowing the industrial growth in the first period of the dictatorship, would not have any play. On the contrary, with automation and technological advance made by transnational industries, this migration only increased urban social problems. Many have returned to the countryside, as shown in the preliminary results of 2007 Agricultural Census. In this sense, agrarian reform settlements worked as surplus labor absorber, initially coming from modernized agricultural regions, and later from urban peripheries. Recent settlements show increasing urban worker beneficiaries, as indicated the research carried out in the Triangulo Mineiro (SHIKI et al., 2000). The former minister of agriculture Antonio Cabrera, who conducted agrarian policy, asked a field research to FAO to show the inefficiency of the agrarian reform policy. Surprisingly for the former minister, the research results have shown the opposite. The report produced by Guanziroli, the FAO consultant at the time, showed productive efficiency, in spite of the difficulties in the access to the market, fragile natural resources, precarious infra-structure, among other problems. Settled families produced, not only produced for their subsistence, but also surplus for the market, creating monetary income above urban minimum wage. Ministers after Cabrera have ordered other studies, as to deepen awareness about family farming efficiency, this time encouraged by the World Bank itself, aiming at promoting market agrarian reform. Evidently, the idea was to show that family farming was so efficient that State unproductive land expropriation policy was not needed and else, land market would be stimulated and financed. So, from the Ceará's experiment, Land Credit was created, now administered by the MDA. Still in the efficiency issue, the bet in role of family farming in rural development implied in its capacity to rapidly incorporate technical progress, making the financial support works as a tool for labor productivity increase. 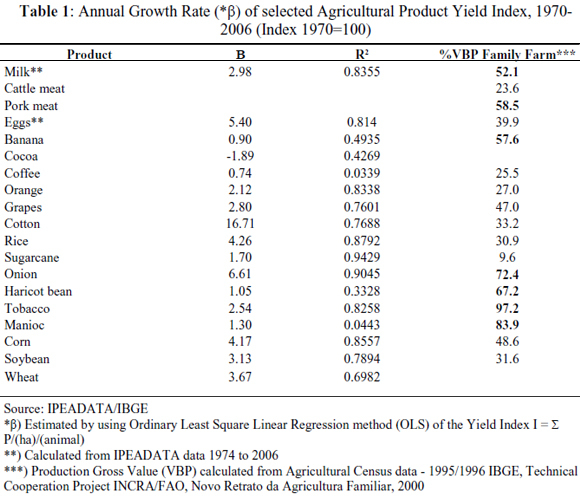 When physical production efficiency indicators of this model are examined (Table 1), one can say that family farming succeeded in incorporating technical progress with the financial and technical support from PRONAF, as it has happened with commercial agriculture with the same policy instruments. So, growth rate of physical crop yield typical of family farming2, such as haricot bean, corn, banana, manioc, onion, pork meat and tobacco, except onion, were quite similar to those produced by commercial farmers, such as soybean, cotton, orange and sugarcane. The indication of lesser productivity of some family farm products such as manioc, may have structural roots, that of low access to productive resources, as the credit itself. As technical progress in agriculture is based on scale gains, this factor can be considered a structural limitation, mainly in the "green revolution" technology model. Many adaptive ways to overcome this limitation have been used by small farmers, such as hiring services for plowing, harrowing, harvesting and transportation, making the productive process more supportive of the service, not the industrial sector. To enter competitive process and gain scale, small farmer incur in high transaction costs. In order to increase production scale, small farmers have to be organized in cooperatives and associations, aiming at obtain resources, technical assistance, credit, education, health, i.e. all the necessary investment for social capital to improve. Another way to dribble high transaction costs of production is to vertically integrate to agro-industries or to services sector with delivery under contract, although the latter would require some organization and additional investments. The World Bank proposed the development of this kind of business trajectory for small farmers: the entry in a business called high value products. This is linked to the food production for very demanding consumers in terms of social and environmental contends, but also to the added value by intensive labor incorporated in the product, naturally processed, in which the organic food is a prominent example. This market is in open growth in the world and in Brazil. Incorporating industrial process in rural labor, adding value in the sense of more labor contend, is a way of increasing the price of the product offered in the market and of increasing the labor time spent by the family members. Most of rural youngsters is attracted to the cities because of the labor conditions on the farm, creating a surplus labor that feeds the industrial reserve army, nowadays mostly in service sector. The migration flow has ceased, not only because of the lack of job opportunities in the city, but also because many non-agricultural occupations are created in rural area. In the case of poor peasant, this non-rural or non-agricultural income is the way how family production without introducing technical innovation can survive. So, a technological solution to make family production effective has to be labor intensive activities. For this, incorporate part of the industrial and service sectors labor such as packing, transport and even commercialization has been the way of helping family production to be competitive. Examples of this are the territories of the Southern states where investments in small scale agro-industries, producers association for commercialization, credit and microcredit cooperatives, handicrafts, organic agriculture, rural tourism, are more frequent, constituting a productive local arrangement with high labor intensity. There are activities diversification, not only on-farm, but in sectors outside farming. In this line of argument, environmental services are more valued and the biodiversity conservation becomes a key factor in the accumulation of family asset, not a cost. The small piece of cultivated land has to have the maximum of environmental service in order to obtain scale necessary to be economically viable in food production but also an asset to explore scenic beauty to attract tourists, and create opportunities for other businesses for the family workers. Extractivist products, coming from the sustainable use of the biodiversity, can enlarge space for family economy, contributing for the conservation policy. As in the conventional agricultural modernization, that of family farming is also partial, excluding, and concentrates income. Create a well-off rural petite bourgeoisie, but leave millions of families in still in poverty, and beneficiaries of Bolsa Família program. The innovation required by the family farming has to be a mix of scientific knowledge on local ecology, enriched by popular culture. So, family farmer gains productivity in some given crops, mostly the more intensive in labor and less in productive capital and more knowledge appropriable by the farmer. The science incorporated in pesticide is not appropriable by the rural producer, is only bought and used according to prescription. What rural producer has to know is how ecosystem works, the interaction insect-plant and find natural way to avoid insects to become pest or to transmit diseases. The producer needs to know the population dynamics of insects, bacteria, fungi, earthworms and how a plant with economic interest develops in this biodiverse environment. An ecological agriculture has to have more science, not less. Just that is not laboratory science only appropriated by oligopolistic industries, and imposed to the farmer. That is why a great deal of educational synergy is needed. Access to financing through PRONAF/MDA, is growing and to date more than two million family farmers had at least one contract. Many studies on family farming forward the idea that, with this technological model, the same process of land and income concentration is starting to outline. This is a process of accommodation to the technological model that defenders of agroecological model transition want to overcome. In this transition, the National Policy of Payments for Environmental Services, in discussion at federal level, can be a valuable tool. The innovative approach of Proambiente: recognizing the value and payment for environmental services. Proambiente's pilot experience, a program constructed from the criticism to the productivist model in the Amazon, a biome rich in biodiversity and with restrictive land use (only 20% of the property can be legally cultivated) brought about important lessons that can be the answer to the problem of high transition costs. Proambiente is a program resulted from the agrarian debate in the Amazonian region led by the National Confederation of Agricultural Workers (CONTAG) and joining organizations such as the Amazonian Workgroup (GTA), the Coordination of Brazilian Amazon Indigenous Organizations (COIAB), the National Rubber tappers Council (CNS), The Amazonian Institute for Environmental Research (IPAM), the Brazilian Enterprise for Agricultural Research (EMBRAPA) and other, representing family farmers, indigenous peoples, extractivist families, artisanal fishermen, generically named as family producers. A local management structure has been devised with a Local Steering Committee and a Regional Council, to ensure participatory management, also including some local public administrators. Regionally, the program is structured in eleven pioneer poles, implemented through procedures conducted by a local technical team especially hired by MDA. The team starts by carrying out a rapid rural appraisal followed by the preparation of a farm management plan and the organization of community groups. Community groups make a deal in which each producer compromises to meet their self-targeted actions. Initiated in 2000, the program was launched in 2003 by the movement Amazonian Grito da Terra in the state of Acre, with the presence of the then minister Marina Silva and the President Lula. In 2004, the program was handed out to the Ministry of the Environment, which, nevertheless, could not assume entirely as a government program for not having legal instrument for that. First, the Proambiente shows that agroecological management, introducing practices such as agro-forestry system, the enrichment of secondary forests with economic species, can be viable alternative to the productivist model. Second, agroecological management is alternative to traditional 'slash and burn' practices, when leguminous species are introduced in order to restore soil fertility, avoiding deforestation of fertile land for the cultivation. This practice can be enrolled as eligible for the avoided deforestation program, contributing to reduce greenhouse gas emissions, the second type of environmental service. Third, these environmental services have economic value, as for the case of carbon, a market that remunerates carbon emission reductions, the CDM and voluntary (quoted in CCX, Chicago Stock Exchange) markets. As these environmental services provided by farmers benefit society in general, and in the case of carbon, the world community, they claim for remuneration from the society for these services. This is the novelty of the program and it can solve the problem of high costs of agroecological transition. The applicability of this mechanism for the case of agrarian reform settlements is straight. The large majority of settlement projects is implemented in highly degraded lands, exhausted to the limit by the former farm owner, with drastically reduced land productivity to the point of being considered unproductive and being expropriated by the INCRA. Other settlement projects are implemented in lands ecologically fragile, with low productive capacity. In all cases, settled families receive financial support for the implementation, which is used mostly for their own subsistence and dedicate the workforce for the conversion of formerly abandoned land into a productive farm unit. After this implementation phase, productive investment credit is offered with 45% rebate on the principal and subsidized interest rate of 2% a year, to build a productive structure, but so far there is no consideration for the fact that the received land was in terrible productive condition. In sum, the debate on the biodiversity conservation in the agrarian policy is on the agenda and its dissociation in policy analysis only brings difficulties in the understanding of the reality. GOODMAN, D.; SORJ, B.; WILKINSON, J. Da Lavoura às Biotecnologias. Rio de Janeiro: Campus, 1990. 192 p.
GUANZIROLI, C. E.; ROMEIRO, A.; BUAINAIN, A. M.; DI SABATTO, A; and BITTENCOURT, G. Agricultura familiar e reforma agrária no século XXI. Rio de Janeiro: Garamond, 2001. 284p. HARDIN, G. The Tragedy of the Commons. Science, v. 162, p.1243-1248, 1968. HUNT, D.; SHIKI, S.; RIBEIRO, R.; BIASI, D.; e FARIA, A. Comparação de indicadores de desempenho de produtores de leite localizados dentro e fora de assentamentos de reforma agrária no Sudeste do Brasil. Revista de Economia e Sociologia Rural, v. 42, nÂº 1, p. 211-248, Jan/Mar 2009. MAZOYER, M. e ROUDART, L. Â Histoire des agricultures du monde: Du néolitique à la crise contemporaine. Paris: Ed. Du Seuil, 1998. 533p. SHIKI, S.; GARLIPP, A.A.B.P.D. ; FERREIRA, E.W. ; BERTOLUCCI Jr, L.; BORGES, M.M.C. ; e RIBEIRO, R.A. Reforma agrária e mercado de trabalho - novo perfil de demanda de terra no Triângulo Mineiro. In: Anais do Encontro de Economia Mineira, 2000. Diamantina. Anals, Diamantina, 2000. SMITH, A. Teoria dos Sentimentos Morais. São Paulo: Ed. Martins Fontes, 1999. 457 p.
WANDERLEY, M.N.B. A emergência de uma nova ruralidade nas sociedades modernas avançadas - o "rural" como espaço singular e ator coletivo. Estudos Sociedade e Agricultura, nÂº.15, p. 87-145, 2000. 2 These products were considered typical of family farmer because represented more than 50% of the VBP, using the 1995-6 Agricultural Census data.